Directions: From US Highway 160 turn north on Union to North Street, turn east to follow curve into the park. The Oswego Swimming Pool was constructed in the mid 1930’s, a Public Works Administration project. Many improvements have been made to the swimming pool itself however the bathhouse remains for the most part as originally constructed. 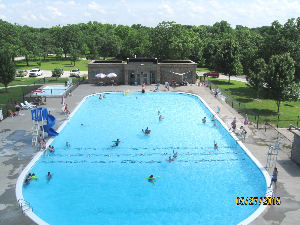 The pool typically opens Memorial Day weekend and through the second or third week of August. The phone number is 620-795-4913. There are six different passes available and are listed below with the cost per season. Passes may also be awarded as prizes or promotions for different events. Passes do NOT include pool parties, special event swims such as "Midnight Swims", and Aqua Aerobic Classes. General Admission - Cost $1.00 Hours are 1:00-6:30pm daily. Individual Pass – Cost $45. This pass is for one person only and is not transferable. Family Pass – Cost $80. This pass is for "Immediate Family" This includes parents, children 18 years and under who are living at home and children who are in college and home for the summer. (Adult children who are no longer attending school and have moved back home will need a separate pass.) The only exceptions to this are grandparents raising a child or if there is a foster-child in the home. Both of these exceptions require proof of guardianship. 10-Swim Pass - Cost $10. This pass can be used as one person going 10 times or 2 people going 5 times, etc. until the 10 individual swims have been used. Senior Citizen Pass – Cost $15. A pass for citizens age 60 and over. This pass does not include Aqua Aerobics, see "Combo" pass. Aqua Aerobics – Cost $20. This pass is required for any age who would like to participate in Aqua Aerobics classes. A pass is necessary even if the swimmer may already have purchased a Senior Citizen or Family Season Pass. Classes will be Mondays, Tuesdays & Thursdays at 5:30-6:30pm and from 4:15-5:15pm on Wednesdays. There is no classes on Friday. Senior Citizen/ Aqua Aerobics “Combo” Pass - Cost $30. This pass is for citizens age 60 and over that would like to take the Aqua Aerobics class in addition to the regular swim pass for seniors. Private Parties – Reservations for pool parties must be made and paid for at the pool by calling 795-4913, (Parties can be scheduled at the City Office prior to the pool opening in May.) Pool parties are held from 7:00 - 9:00 pm and cost $65 for up to 35 in attendance. For any more than 35, the cost is $1.50 extra per person. Reservations/Agreement Form – The $65 fee and agreement form must be completed at the time the reservation is made. If the party is canceled without two weeks notice the $65 fee will not be returned. An exception will be made if the cancelation is due to the weather and will be determined by the Pool Manager. An estimate of the number of people attending is needed at the time the reservation is made so sufficient staff can be scheduled. However, the cost for more than 35 in attendance will be collected the night of the party. Outside Food or Drink - No outside food or drink is allowed for an event unless approved by the Pool Manager. (For an example a birthday cake may be allowed for a birthday Pool Party.) So please be sure to check with the Pool Manager. The concession stand will be open. You may bring your own music, however, if the management feels the language is too offensive, you will be asked to play something else or turn it off since the music from the pool area can be heard by others in the park. Public Parties - Watch the website, newspaper, FaceBook and other sources of communication for notices about public pool parties which are sometimes referred to as "Midnight Swims". Admission fees will apply even to those holding season passes. The Concession Stand will be open during these parties and music will be provided by the pool staff only. The price remains the same as last year - $28. To register and get details call the pool at 795-4913.